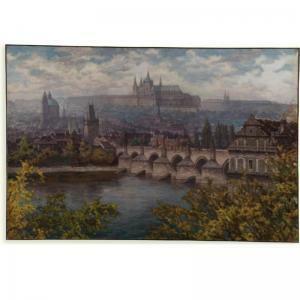 Find artworks, auction results, sale prices and pictures of Jaro Prochazka at auctions worldwide. 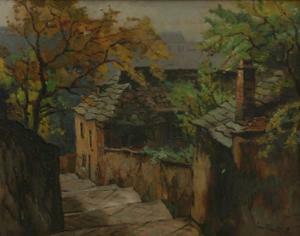 Jaro Procházka (1886-1949) PARISER STRASSE Öl auf Faserplatte, 27x32 cm, signiert und gezeichnet rechts unten "Jaro Procházka Paříž". Gerahmt. 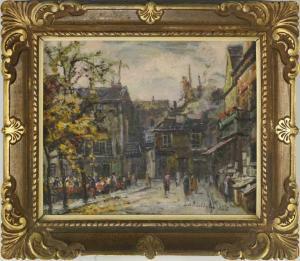 Zustand A. Jaro Procházka (1886-1949) STREET IN PARIS Oil on hardboard, 27x32 cm, signed and marked lower right "Jaro Procházka Paříž". Framed. Condition A. 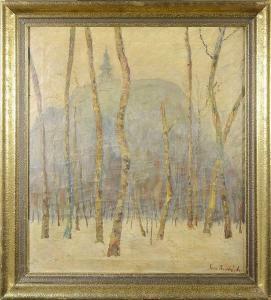 Lot 149: Jaro Procházka (1886-1949) Description: VIEW OF NÁCHOD CASTLE. 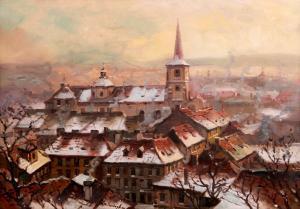 Oil on canvas, 73,5 x 65,5 cm, signed lower right „Jaro Procházka“. Framed. Condition B. POHLED NA NÁCHODSKÝ ZÁMEK. Olej na plátně, 73,5 x 65,5 cm, sign. vpravo dole „Jaro Procházka“. Rámováno. Stav B. ANSICHT VOM SCHLOSS IN NACHOD. Öl auf Leinwand, 73,5 x 65,5 cm, sign. rechts unten „Jaro Procházka“. Gerahmt. Zustand B. Oil on cardboard, 50 x 70 cm, framed, glazed, undated, signed in the bottom centre. Czech painter and graphic artist, he studied at the Academy of Decorative Arts in Prague under professor Jakesch. See T 2/317, V 3/628. EXHIBITEDPrague in 1936 with the group "Jednota"
traveled in Germany, Italy, Belgium and in England.